With warmer climes just around the corner, Selina Lake’s recently launched book, Garden Style, showcases how to transform your space, however big or small. And featuring extensive indoor and outdoor ranges, Dobbies will ensure you leave its garden centres brimming with ideas and motivation to bring your garden up to date for the season ahead. The new free-to-join Dobbies Club complements the existing membership club and is available to sign up to from this month, giving members a whole host of exclusives, savings and member benefits. The weather is finally changing and we are all enjoying lighter and longer days. If you have a blossoming shrub or tree, such as crab apple, lilac or edible fruit tree in your garden, now is the time to cut a few stems or branches laden with blossom flowers as these can be used in much the same way as cut flowers. Display your gatherings in glass vases by picking one or two stems for each vase to create a pretty spring style arrangement (as shown above). I like to add in a few potted plants in between the scented flowers and place the vases and plants in a loose line down the centre of the table. It’s a relaxed look that will invite your guests to sit and soak up the atmosphere. Add a few throws or blankets to chairs in case it’s still too chilly or the sun goes in. For me, a potting shed is a creative space that can be both beautiful and practical. I have recently embarked on a little spring cleaning in my own shed to get it ready for the seasons ahead. If your shed is more messy than marvellous, invest in some sort of shelving unit to display all your prettiest garden accessories, seed packs and vintage gardening books. Everything else not so beautiful can be stored out of sight in a handy cupboard or storage box or sorted and recycled. Add a few botanical prints to the walls as well as hooks for hanging pretty tools, baskets and kneelers. A tabletop garden is a great way to create a seasonal display. Any flat surface in your outside space offers an opportunity for a lovely arrangement of potted plants and garden collectables, even the roof of a log store. For a spring tabletop display, gather a selection of containers planted with spring bulbs and place on the surface, and nestle watering cans, mini greenhouses or anything else decorative between the pots to add interest. Once the bulbs have finished flowering you can update the display with summer annuals. Just as with interiors, it’s often the smaller details and finishing touches that enhance a garden space, and there are many ways to add lovely decorative touches to your garden. Using lanterns to add light, group together a display of large glass bottles to make a vignette in a garden nook, or use a wooden-handled spade plunged into the centre of your flowerbed, which birds will love to use as a perch. Creating homes for wildlife is another way of introducing decorations as well as encouraging bird and insects to shelter and nest. Gorgeous bird boxes and bug hotels add interest to otherwise plain walls or fences. Gather up a selection of containers filled with your favourite container-loving plants. Start to arrange the collection into a group, perhaps against a wall or fence, and use a bench to give some of the pots different heights and juxtaposition. Make sure all the containers are in good positions to receive plenty of light and rainwater. 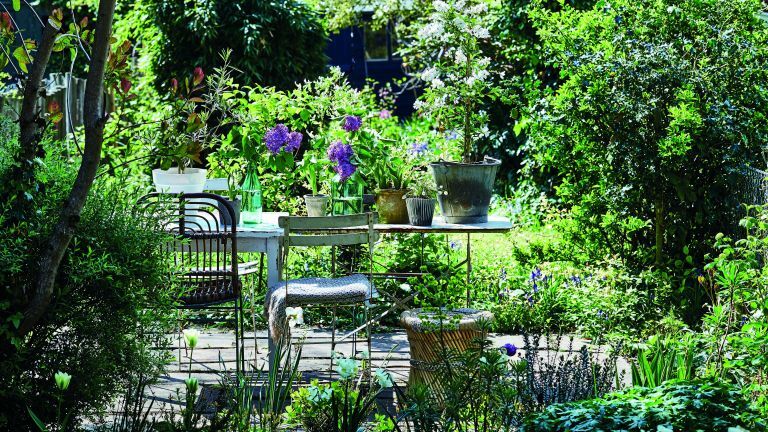 Selina Lake’s new book, Garden Style, is out now from Ryland Peters & Small. Find your local Dobbies Garden Centre store and browse the online range at dobbies.com.